The Cuban pianist Omar Sosa is a born collaborator and his taste in musical partners ranges far and wide. In the past he has worked most effectively with American folk/blues singer/banjo player Tim Eriksen and Italian jazz trumpeter Paolo Fresu; here he is co-leader with the Senegalese kora player Seckou Keita who is now resident in this country. Transparent Water is full of clear, bubbling, flowing and tumbling sounds as befits its title. The two players interlace their not dissimilar instruments into a gentle ebb and flow, luxuriating in the subtle timbral variations they can get. Those timbres are further enhanced with added electronic washes behind them and a variety of additional percussion sounds from all around the world, mainly made by Venezuelan Gustavo Ovalles but also from the Chinese sheng and bawu of Wu Tong, for example. In addition Keita sings on some tracks. The resulting music is both serenely atmospheric, able to function as a background soundtrack to the listener’s life, yet also worthy of more active engagement with its adventurous improvisational twists and turns, and constant reinventions. It has an air of devotion, filled with a quiet and often quite restrained joy. The potential downside of this kind of “world music fusion” is that it can sound like a mixture made for the sake of it, and a mess as a result. 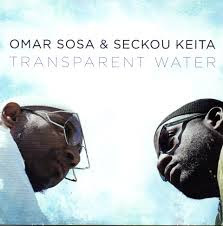 But the shared vision of Sosa and Keita overcomes any such risks - they may be eclectic in their influences but they are true to their own musical characters and what they want to achieve. It’s a beautiful album from start to finish.